Which Baby Carrier is Right for You? When I gave birth to my second child, I knew my life was about to change. I had no idea how I would handle life with two little kids — one being a newborn. Make meals? Fold laundry? Grocery shop? How was a mom of two babies supposed to navigate all of her responsibilities? But, then a good friend introduced me to the benefits of baby wearing and I was hooked! It seemed like a very logical answer to a seemingly daunting question; strap your baby on, and she goes with you – everywhere you go! The trouble is, as much as baby carrying is helpful and beneficial to both mama and baby, there is definitely a learning curve. You can’t just strap your baby on and you’re good to go. Well, you can, but it could potentially do harm to both you and your baby. So, if the idea of baby wearing is new to you, then this post will help you decide which baby carrier is right for you and your baby. Let’s compare shopping for a baby carrier to shopping for shoes. Just as shoes come in many shapes, styles, colors, price-points and varieties, so do baby carriers. Different shoes have different functions and the same is true of baby carriers. I would never say there is a one-size-fits-all shoe and that you should just buy the same pair of shoes that I did. That would be silly. What works for me, might not work for you, and vice versa. That being said, let’s take a look at the various types of baby carriers so you can familiarize yourself with the options. Once you know the type of baby carrier you are looking for, you will narrow the playing field by a ton. You won’t have to weed through every option. You’ll know which type of baby carrier is best for you and then from there, you can shop just from that category. I remember being very overwhelmed at the endless options when I decided to start wearing my baby and spent countless hours researching. I had no idea what I wanted or what I was even looking for. My objective is to break it down for you and spare you the headache and time, so you can get started right away with keeping your precious little one close to you! Sling – A baby sling is a soft piece of fabric that goes over one shoulder and forms a pouch for the baby to ride in. 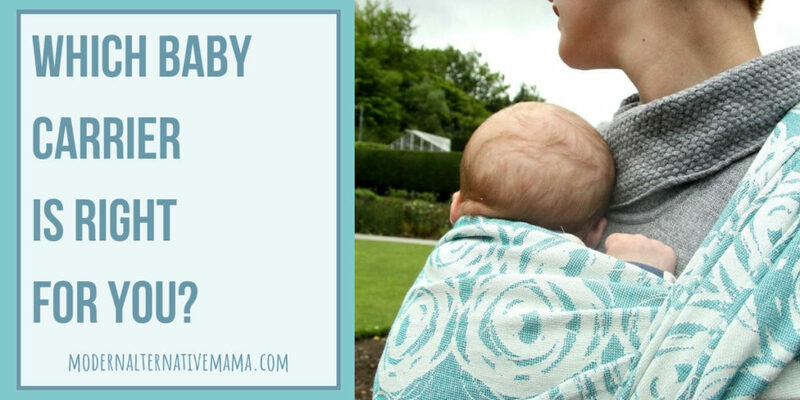 Mei-Tai – This is a buckle-free wrap with a structured seat that ties around the mama’s body. Backpack – A traditional baby carrying backpack sits on a steel frame and is mostly used for hiking and foot travel. This type of carrier can only be worn on the back, as the name suggests. Soft-Structured Carrier – The SCC carriers may or may not have buckles (typically they do) and offer a seat for the baby to sit in. They can be worn on the front or the back of the mama. Now that you know the different types of baby carriers, there are still a few more considerations before deciding which one to choose. It’s important that you think about the type of body you have. Again, no one-size is best for everyone. I can’t make a specific suggestion for you, but consider doing a Google search for which carrier is recommended for *enter your body type* and see which results come up. Let me just say that you could spend a small fortune on baby carriers and some women do! No shame in that! We all have our hobbies and preferences. But it would be wise for you to know about how much you want to spend before you start shopping because there are so many adorable choices. It would be tempting to spend too much. There are a variety of baby carrying Facebook groups available where you can find very nice, second-hand baby carriers. Search for baby carrier swaps in Facebook groups. 3.What Physical Needs do You Have? You’ll definitely need to know your physical needs and limitations. If you are big-chested, again, try Googling *best baby carrier for large chested women. * If you have a bad back, you can do the same thing, and so on. You could find the cutest baby carrier, but if it doesn’t work for your needs, it won’t work. We’ve talked a lot about you and your needs, but what about the baby’s needs? I highly recommend checking reviews and recalls to see if the carrier you are considering is safe for your baby. What do people say about the comfort level for the baby? Also, please make sure the carrier you purchase is supportive enough for the baby’s back. Be careful not to buy one that dangles the baby from the middle of the legs. Your baby should “sit” in the carrier. Her knees should be at the same level or above her hips and never below (not dangling). 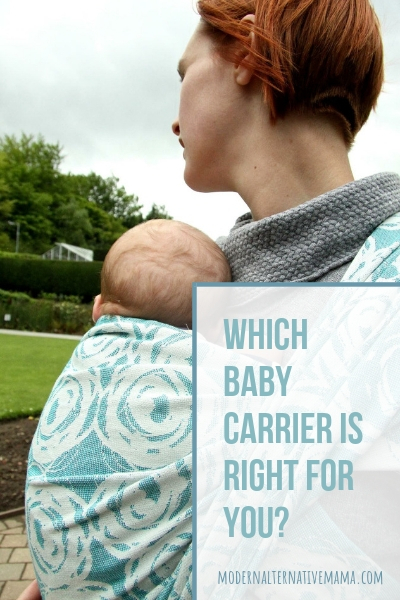 Don’t buy a carrier that faces the baby outward, unless it’s specifically fashioned for outward carrying. Is it important to you to have flexibility in how you carry your baby? There are some pretty creative holds that people have come up with. If you want to be able to try different ways to carry your baby, you’ll want a carrier that offers that flexibility. Wrapping it All Up – No Pun Intended! As you can see, there are many things to consider before strapping your baby on. Hopefully, now that you know what things to look for, you’ll be a little more prepared when you decide which baby carrier is right for you. Do you have a style or type of baby carrier that you feel would be the best option for you? Which baby carrier is right for you?